Update (Nov 2013): Gold Bay Leaves has moved across the street from the old location. The owner of the former location saw he was doing so well, and decided to kick him out and run his own restaurant. So the real location is now on the right hand side of Soi 101/1. … and you’ve probably eaten at a hotel. 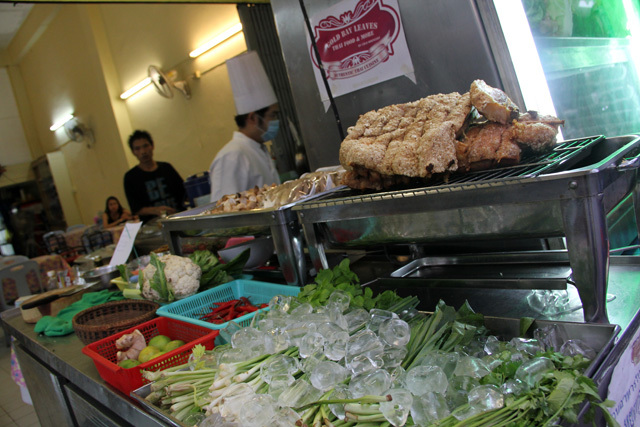 But how about Thai street food cooked by a hotel chef? 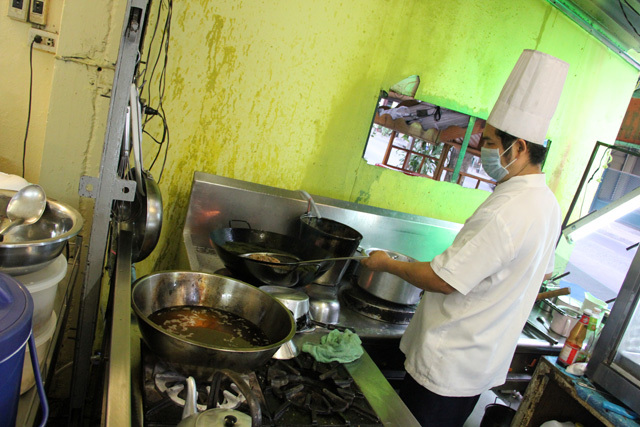 Chef Chai Boonlert is in command of the wok at Gold Bay Leaves Restaurant. He is a former hotel chef who decided to break free from the hotel cooking atmosphere, develop his own restaurant, and cook to his own specifications. The result is a local low key neighborhood dining establishment that serves up delicious Thai food and even a few western pasta style dishes (that happen to be excellent as well). Ok, it’s not completely street food (the restaurant is indoor and prices are a little higher than 40 THB bowls of noodles), but you can sit at a street side table and all dishes are still quite affordable. 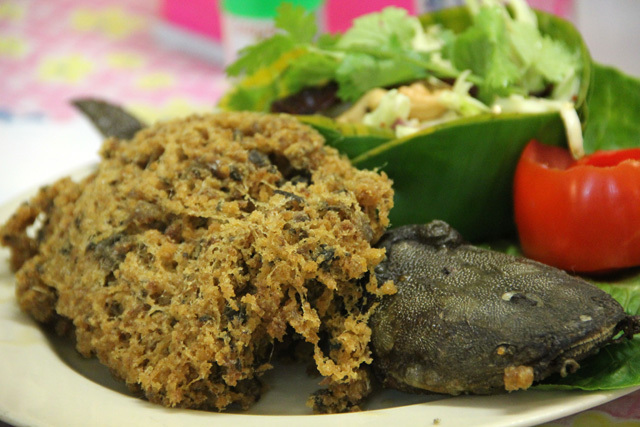 I couldn’t resist ordering the yam pla duk foo (deep fried fluffy catfish ยำปลาดุกฟู), a crunchy pillow of deep fried catfish fluffiness. It’s easily one of the best I’ve ever tasted in Bangkok. The chef kept the head and tail of the fish intact, but its body was reduced to pure mouthwatering deep friedness! Most of the time when you order stir fried eggplant in Bangkok, you get long skinny green eggplant, not the round purple aubergines. When I spotted these guys in the glass display cabinet, I knew they were meant to be on my plate. The pad makua muang (stir fried purple eggplant ผัดมะเขือม่วง) was so delicious, I could have inhaled 20 plates of it in a row. It was seared in the wok with a bit of oil, a few chunks of tomatoes, a light combination of chillies and soy sauce and a generous amount of sweet basil. If you like Chinese food and beef, you won’t go wrong with the stir fried neua pad prik pao (beef with chili sauce เนื้อผัดพริกเผา). The beef was tender and the onions were just lightly scorched to retain their crispiness. 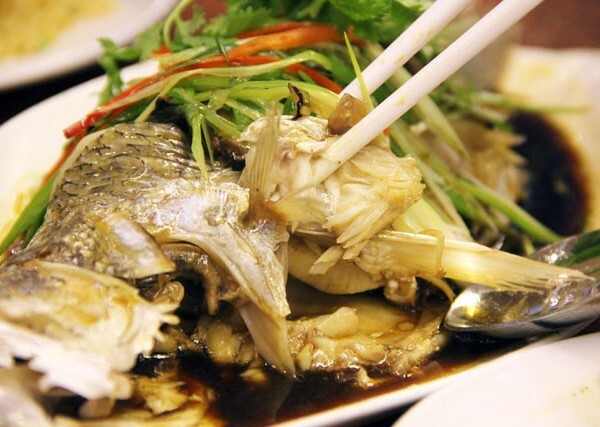 One of the great things about Gold Bay Leaves is that they use only the highest quality and freshest seafood. 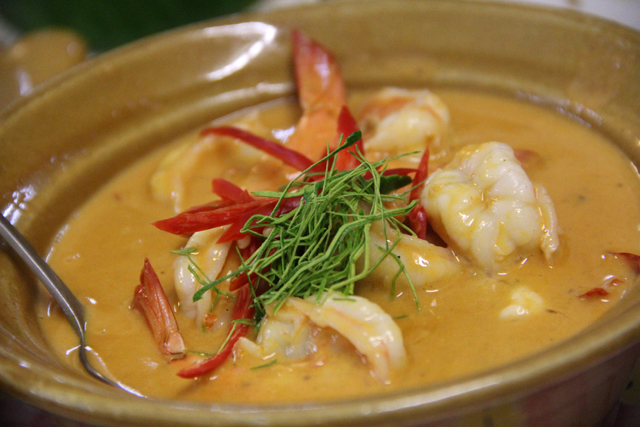 Giant meaty prawns were used in the production of this bowl of panang goong (panang curry shrimp แพนงกุ้ง). 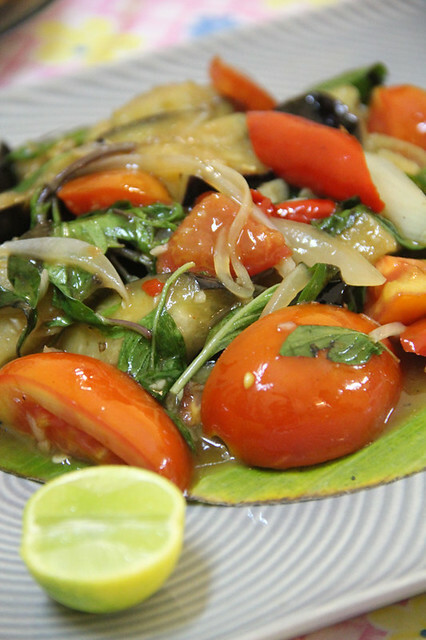 It was mild, but flavorful, and I always enjoy the addition of fragrant sliced kaffir lime leaves. 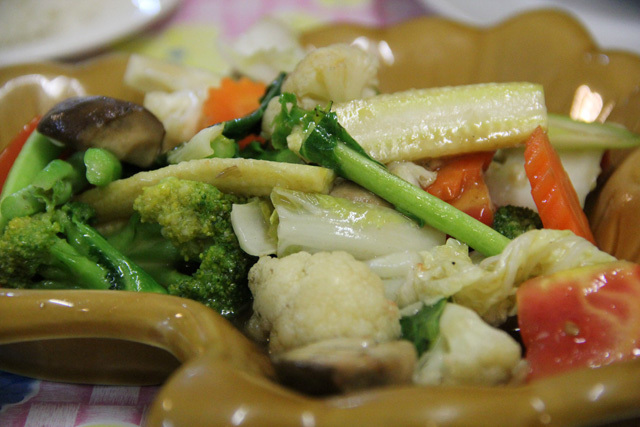 All the dishes were fantastic, even down to a simple plate of mixed stir fried vegetables which included big chunks of brocoli (one of my favorite vegetables on earth), and huge mushrooms. The chef cooked it on an extremely high fire heat, so the wok flamed up, giving it that delicious flash scorched tinge. 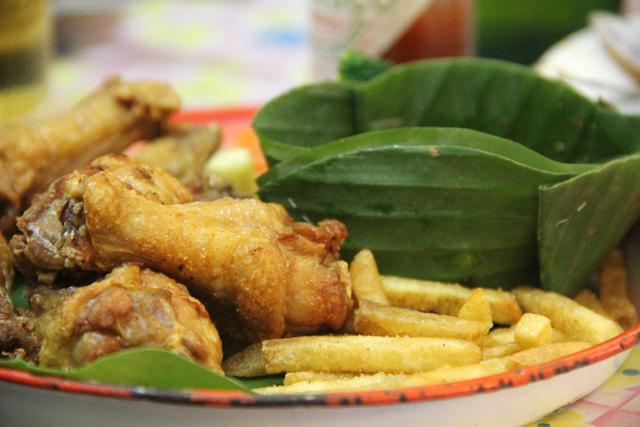 If you’re in the mood for chicken wings and fries, you’re covered. It was pretty average, nice and crispy. 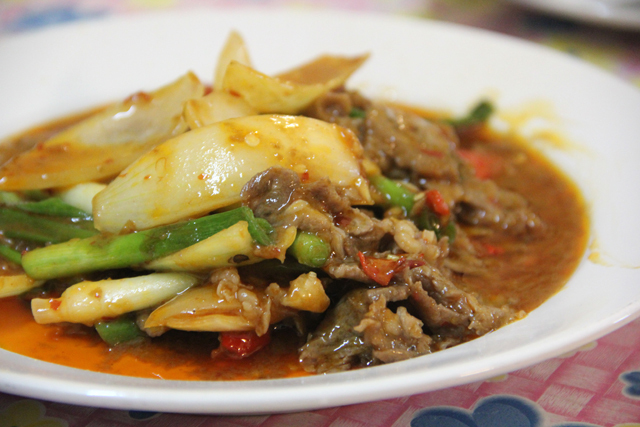 The sauce on the other hand, was scrumptious, a perfect blend of chili flakes, fish sauce and lime juice. Here’s where the experience of the hotel chef comes into play. Navigating through the encyclopedia sized menu at Gold Bay Leaves, you’ll find a giant section at the back filled with traditional and Thai fusion Italian / European dishes. Now, I’m normally a little frightened of eating western style pasta dishes at a Thai food restaurant, but Dwight ordered the panang fettuccine and I got a few samples. Let me tell you, it was wonderful. 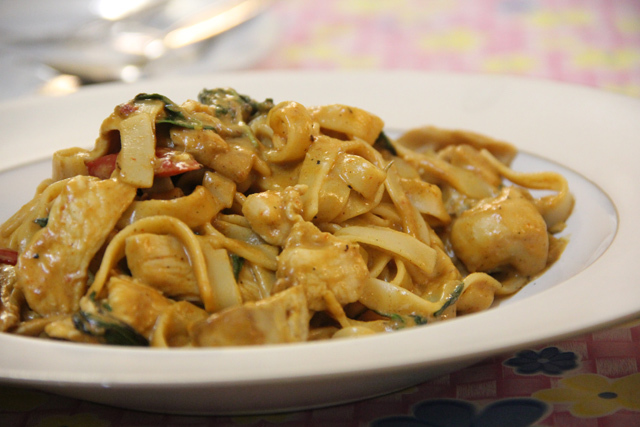 The noodles weren’t overcooked and the sauce was richly creamy and lightly flavored with a Thai panang curry touch. 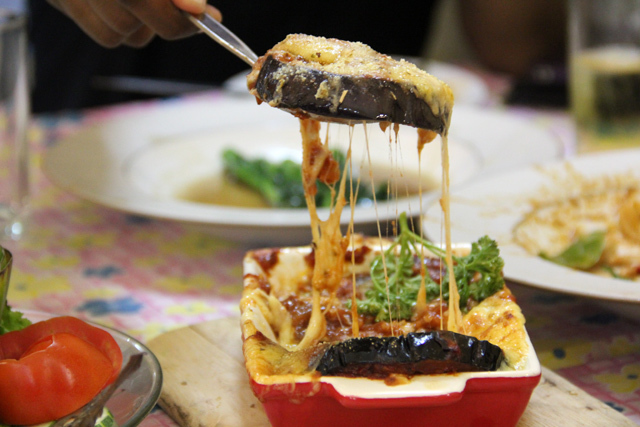 Another friend ordered the cheesy baked eggplant, another dish that was exquisite. The cheese was melted onto the creamy eggplant and lathered in rich tomato sauce to create a real Mediterranean flavored dish – something I never would have guessed to find at a local Thai neighborhood eatery. At the end of the meal, we decided a little more beef would be a fantastic idea… and it was! 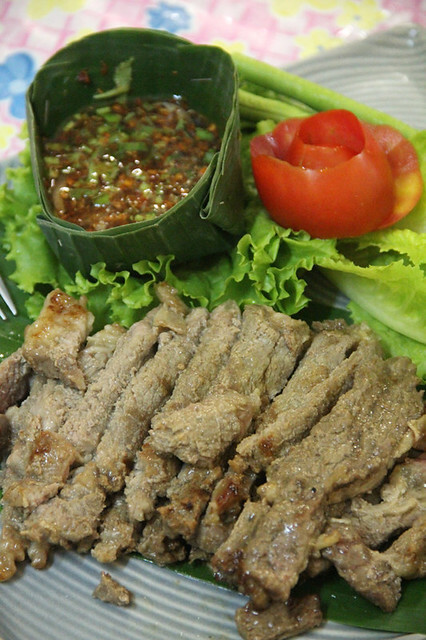 We ordered a plate of neau yang (grilled beef เนื้อย่าง) which the menu had mentioned was made with strictly sirloin beef. It was tender, extremely juice and boasted all the flavor you could ever want in a piece of beef! Price: 180 THB – that’s sirloin beef! I was really impressed by the food at Gold Bay Leaves Restaurant. The chef makes mouthwatering Thai food and even a large selection of delicious pasta and cheese dishes – I didn’t believe it was possible to get both genres of food correct in a single restaurant but the chef pulls it off with precision. Simply put, I was left extremely satisfied and never wanted the meal to end. You should eat here! You can get the Gold Bay Leaves by getting off the BTS at either Punawithi or Udom Souk, and walking down Sukhumvit 101/1 about 200 meters. Restaurant is on your right hand side. 15 comments. I'd love to hear from you! Food was excellent. We had the deep fried catfish salad, squid ink fettuccine with seafood (pasta was undercooked), grilled sliced sirloin (thumbs up from the baby carnivore) and cheesy aubergine (too wet). The chef was very sweet, smiley and spoke to us with a few words of English. So much for blending in with the local wild life. Service from waiting staff was efficient, polite and unobtrusive. It’s a bit of a trek (an hour’s drive on a Saturday night from Upper Sukhumvit) – if it were closer, we would come every week, several times a week! Thanks, Mark. PS: I really liked the chef’s thoughtful and subtle touches to traditional dishes without trying too hard to re-invent the wheel the way “fusion” (cringes) cuisine does. Eg, dried whole chillies in the mango salad was neat, not too clever-clever and delicious. Wanted to try many other things but we were too full after four dishes! Hey Tara, I was just going to message you. Today I went to New Peng Chieng Teochew restaurant for the first time. Loved it! I’ll be writing about it soon, thanks for the recommendations. Glad you found Gold Bay Leaves, food is awesome there and the chef is really nice! Oh, I see. Thanks for letting me know, Mark! Sorry for not replying sooner as I forgot to subscribe to the posts. I only remembered to look when scanning your food map as I often do – I’m somewhat sheepish to admit, haha – and saw that New Peng Chieng had been pinned. I look forward to reading your post! It always feels like being in a time warp for me with tables of older people who look uncannily like some of my Teochew relatives of my father’s generation with a “typical Teochew look”. I started to look at the genetics of southern and Southeast Asia for other reasons and it seems the genetic pools along small linguistic groups like dialects may have been quite isolated until recent immigration in the late 19th to 20th century. Happy Songkran! No problem Tara, good to hear from you, will be posting about it soon! Happy Songkran to you too! I definitely enjoyed the food there and even enjoyed mussels in cheese sauce.No doubt the lady manager is surley but the chef probably seeing a brown skin guy went out of his way and was extremely polite. Will be going there again in January and by the way just 10 steps away is a small icecream parlour serving shaved icecream which is great for cooling your mouth down. Hey Eddie, glad you made it here and enjoyed it! * the “manager” lady is very consistent : she is always unpleasant to say the least ! Hi Antoine, thanks for sharing, most of your thought I disagree with, except the last one – but I’m willing to wait for good food. The staff are always extremely nice to me, and I personally know the chef, who is very friendly!